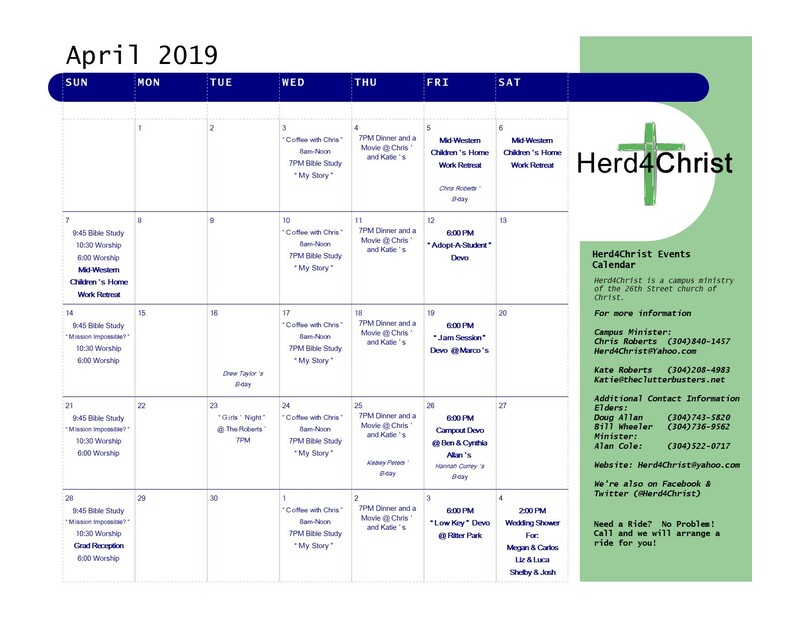 Herd4Christ is a ministry of the 26th Street church of Christ. Our church building is located at 101 26th Street. Below you will find directions complete with maps to help you find our meeting house. 1. From Marshall University get on 5th Ave.
2. Drive from 5th Ave. to 26th Street. There are stoplights here. You should see Veterans' Memorial Soccer Field on your left, Rio Grande and Kroger on your right. 3. Turn left onto 26th Street. 5. Cross 2nd Ave. (stop sign) and drive toward 1st Ave.
6. The building is on the corner of 1st Ave. and 26th Street and will be to your left. 1. Take 29th Street Exit off I-64 (not pictured on map). This will put you on U.S. Route 60. 2. Follow Route 60 to 3rd Ave. (as shown above). 3. Take 3rd Ave. to 26th Street, preparing for a right turn. 4. Turn right on 26th Street. 6. The building is on the corner of 1st Ave. and 26th Street and will be to your left (see red dot on map above). 1. From Hal Greer Blvd. exit drive North toward Huntington on Hal Greer Blvd. 2. Follow Hal Greer Blvd. to 5th Ave. (You will see a Marshall University sign across the road). 4. Follow 5th Ave. to 26th Street. There are stoplights here. You should see Veterans' Memorial Soccer Field on your left, Rio Grande and Kroger on your right. 5. Turn left onto 26th Street. 7. Cross 2nd Ave. (stop sign) and drive toward 1st Ave.
8. The building is on the corner of 1st Ave. and 26th Street and will be to your left.